Donal McSweeney is our Head PGA Professional and is joined by another Qualified PGA Professional, Paddy Sheehy. Both of our Professionals will provide world class tuition and instruction for golfers of all ages and abilities. This is achieved by utilising the latest pioneering technology available Trackman4 and, in conjunction with the latest instructional techniques, both PGA Professionals will offer Members and Guests a memorable and meaningful golf experience at the Golf Academy. Donal represented Munster at Interprovincial level, won the British Universities Championship and won on the Irish PGA Tour with a career low of 63 (-8). Donal has been a Class AA PGA Professional for 20 years. He turned Professional in 1996 after a successful playing career and studied Golf Studies and Sports Management at Kingston University in London for 3 years before joining the PGA. Donal has a wealth of experience in teaching, club fitting and golf retail. Donal also is an avid student of the golf swing and uses Trackman4 for all his coaching and fitting sessions. He is always striving to learn more about the golf swing and how a golfer can improve his/her performance. To advance his knowledge further, Donal has attended many coaching seminars all over the world. Donal regularly attends Continued Personal Development Programmes (CPD) organised by the PGA where seminars are conducted on all aspects of golf, retail, coaching and equipment technology to allow PGA members update their skill and knowledge base. Donal has been involved as a coach with the Irish Ladies Golf Union (ILGU) and Golfing Union of Ireland (GUI) for several years. Paddy enjoyed a successful amateur career, representing both Munster and Ireland at Boys and Youths level. Before joining the PGA, Paddy attended Limerick Institute of Technology where he successfully obtained a Bachelor of Science (Honours) in Civil Engineering Management. In 2011, Paddy decided to follow his dream and joined the PGA while playing off a handicap of Plus 1. 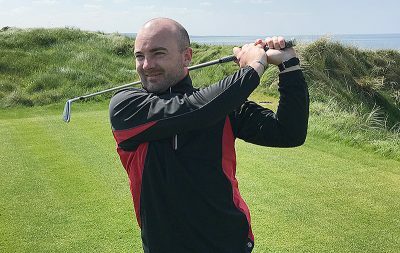 After successfully completing the Foundation Degree in Professional Golf Studies at the University of Birmingham in 2015, through the PGA, Paddy has worked in Golf Coaching, Club Fitting and Golf Retail. Paddy is also a keen student of the golf swing and constantly keeps up-to-date with any new developments within the game. He regularly attends CPD Programmes to update his knowledge on the game and believes that “correcting golfers’ basic fundamentals is the key to success and consistency”. Our professionals have the ability to deliver all aspects of golf tuition. Through their expert knowledge, the quality and flexibility of both professionals is amongst the highest calibre within the game. They offer unrivalled service for all gofers as well as dedicating time to specific groups such as juniors and ladies. Their specialties include low ball flight; pitching from bare lies; chip and runs; the ‘Texas wedge’ and, of course, how to escape deep bunkers along with much, much more. Throughout the summer, Donal & Paddy will hold 1 hour clinics on a variety of topics for €10.00pp. These will include chipping, pitching, putting, 100 yard shot etc. Members and visitors looking to book lessons should book online by clicking HERE or contact the Golf Shop. Our Junior Programmes aim to establish sound technique and provide the student with an ideal base from which to grow into a complete player. Our junior camps are planned for children to improve all aspects of their golf in a fun and relaxed environment while making new friends with children of similar age. Members looking to book lessons can do so by clicking HERE contact the Golf Shop. All junior camps must be booked by contacting the Golf Shop. During the summer months, there will be a number of Custom Fit Days so that the members can avail of the opportunity to be custom fitted for the latest golf equipment from PING, Taylormade, Titleist and Mizuno. Custom fitting for putter can be arranged at any time.